Hello all. As most of you know I (Allen) suffered from irregular chest pains and trouble breathing last night. I was taken to the hospital by ambulance and observed overnight and through the next day. I still don’t feel 100%, but I praise God for His mercy and grace in helping us through this unexpected ordeal last night and I have returned home. • I praise God that I could call out to him while in pain, knowing that He is my sovereign God. • I praise God that I have a wife who joined me in calling out to Jesus, that we can both know Him and turn to Him. • I praise God that the children were already asleep while this painful episode occurred and they only found out about it the next day. • I praise God for the quick response to Sharon’s request for an ambulance, and for a hospital that was 15 minutes away. • I praise God that the EKG, blood pressure and blood tests all indicate that I did NOT suffer a heart attack, but ‘unstable’ angina pectoris. • I praise God that a kind nurse allowed Sharon to spend the night in my room even though they don’t ‘officially’ allow it. • I praise God for being able to fall asleep. 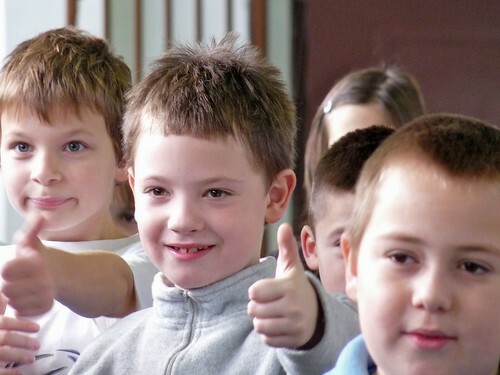 • I praise God for the quick response of friends who were able to watch over our kids, and those who quickly spread the news to others who would graciously pray for us in this time. Above: An amazing turn out for our show which was optional and required the kids to return a permission slip filled out by parents. Lots of these kids know us from our various outreaches to children in town or through out VBS in the Summer. Some of them have even begun attending our church without their parents. For the first time, we experienced a series of technical problems. First we had an issue with the outlets in the gym not working. Once we finally got power to one of the outlets, we found out that our speaker was not working. Without the speaker, we couldn’t do our show. 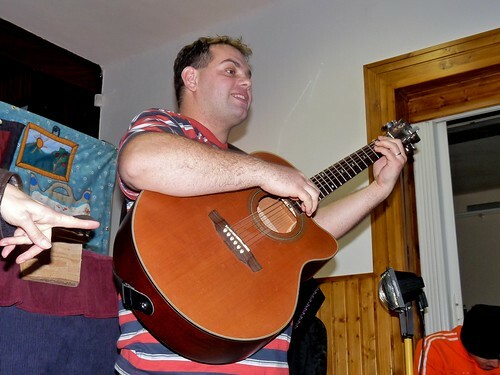 Thankfully, we had another speaker at Miki’s house and because the show was in PetÅ‘fibánya, he was able to run home quickly to retrieve it. If this would have happened in any other place, we would have had to cancel our show. We praise God that before this final day, there have been no such problems. 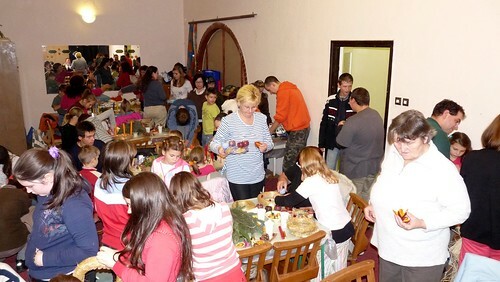 In the end, by God’s grace we were able to get everything working present the Christmas show to the kids. 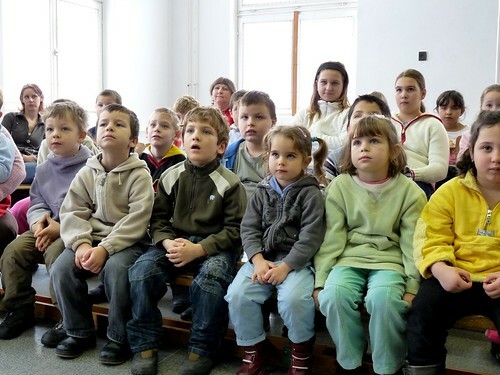 Above: In the past years, every year PetÅ‘fibánya is the most difficult place to present out show because of the behavior of the kids and the lack of control the teachers have over them. This year was no different, but mild in comparison to years past. 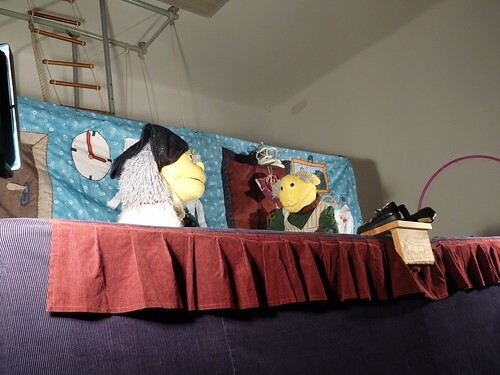 I was very thankful that the kids payed attention throughout the puppet show and the few voices of distraction that began to rise did not persist through the show. We are very grateful for those of you who have been a blessing to us and to these kids as you have prayed for us and this ministry over the past two and a half weeks. Over a thousand seeds have gone out, over a thousand kids have heard that Christmas is about the birth of Jesus Christ our Savior. 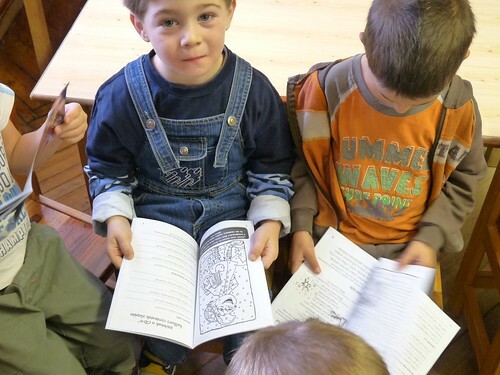 Over a thousand kids have received evangelistic packets with a CD. This is God’s gracious work of opening the doors in these schools and providing the means with which we can preach HIs Gospel to children. Have a Merry Christmas knowing that the Messiah has come and has finished the work of salvation. Above: Entering the neighboring town of Rózsaszentmárton with it’s entrance marked by iconic machinery once used for mining. 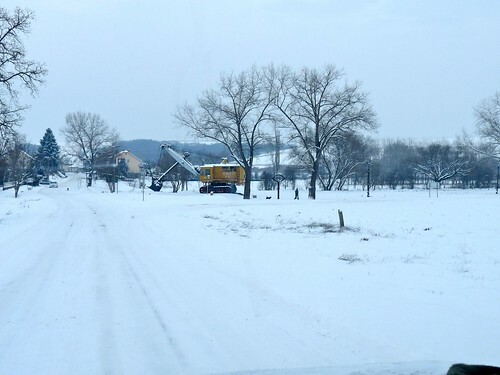 This town is just over a small mountain from PetÅ‘fibánya, and once again, because of the snow fall last night, we had to throw snow chains on my vehicle to make it over the mountain in the slippery conditions. 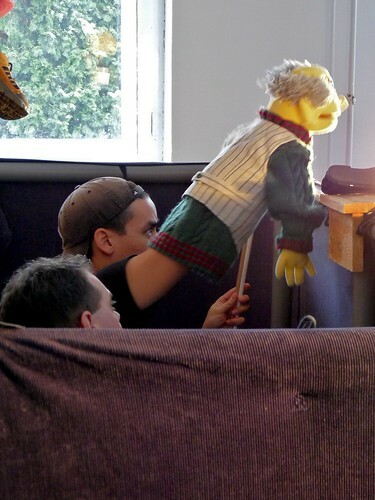 One of the elderly men in this home recognized teenager Norbi who travels with us to help in with our puppet show. He was quick to tell Norbi, “I can’t believe you are with these good people. What a change!” Apparently this man knew Norbi’s background and how deep Norbi was in with the wrong crowd. We are also thankful that Norbi chooses to spend time with us and really considers us his closest friends. 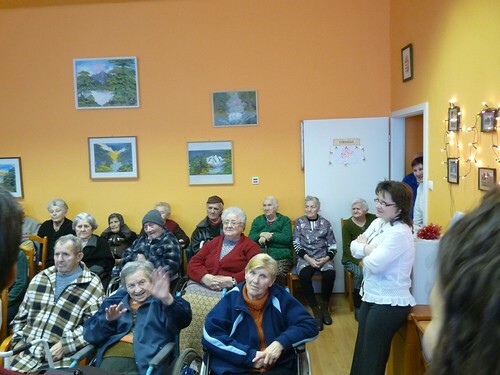 Above: The elderly really enjoyed the Christmas songs and the show. There were many that thanked us afterwards and asked us to return at Easter. 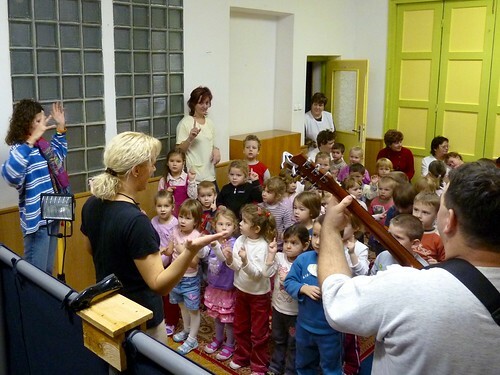 The woman pictured above in the white shirt standing on the right approached me after the show and said, “This was so special, would you be willing to perform this in Rózsaszentmárton’s preschool as well?” I told her that we have attempted for years to enter into their schools, but we need to be invited. She said, “No problem, you’re invited.” She talked to a co-worker, who then made a phone call. 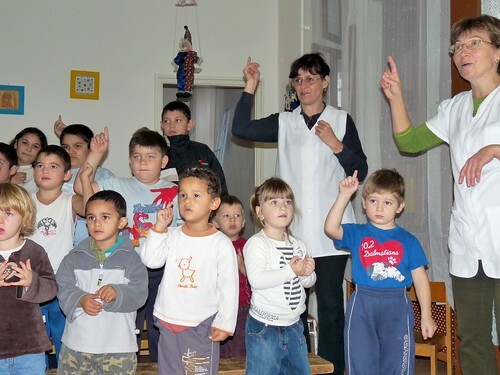 My hope was that by Easter we would be invited into Rózsaszentmárton’s preschool, but moments later the women approached and said, “I just called them, are you guys able to go there right now to perform?” What an answer to prayer! Since we had no other shows lined up for the day, we were completely to say yes. 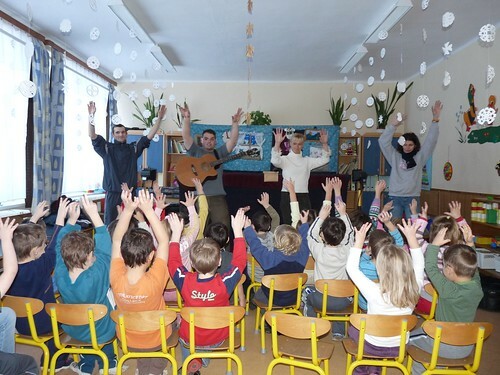 Above: Praise God, our first opportunity to perform our show in Rózsaszentmárton’s preschool... an amazing answer to prayer! 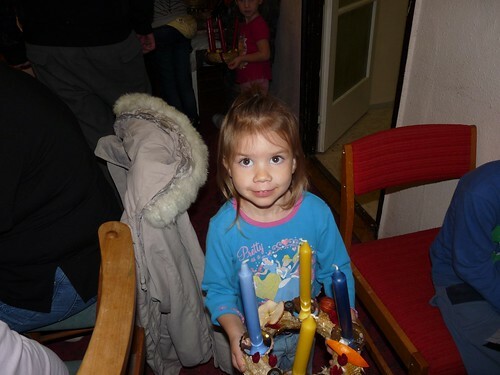 Above: Adrien, who attends here, is the daughter of DezsÅ‘, one of the Hungarian leaders in our church plant. 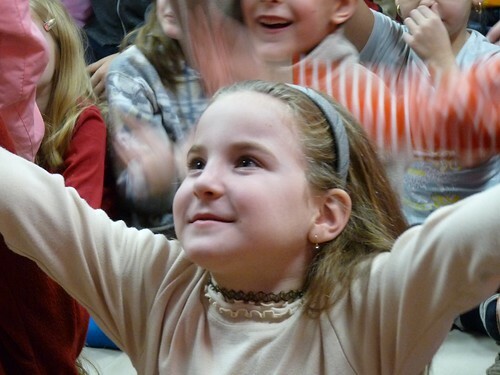 Above: After Miki explained at the end of the show that we wanted to give a gift of a CD and a magazine, one of the Preschool teachers said in amazement, “To all of the kids?” She was so surprised that we brought the show without charge and also went further to give gifts to the kids. 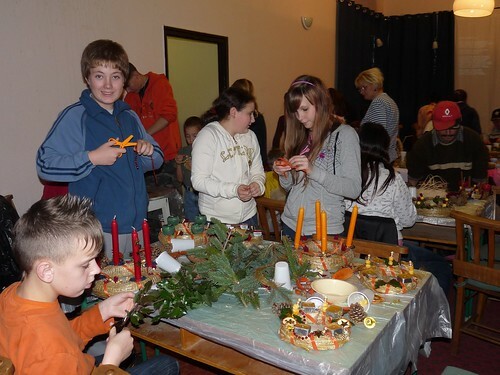 This was a great first experience in Rózsaszentmárton and has now opened the door for us to return at Easter. 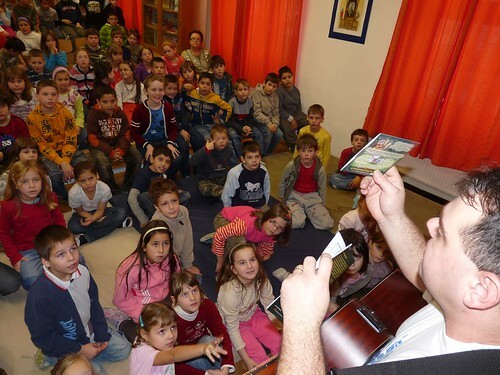 It also opens the door for more to hear about our VBS in the summer and more kids to hear the Gospel from Rózsaszentmárton. Praise God for this awesome answer to prayer! Above: Church member Gabi’s sister Niki (above) was baptized on Sunday in our special Christmas service held at Miki’s house. Niki was initally introduced to the basic truths of God’s word and the Gospel as a child when she began attending Miki’s Bible class. After drifting away as a teen she returned and began attending church after seeing that her brother was being transformed by Jesus Christ. She wanted what her brother Gabi had. After a few years of faithfully attending, Niki came to understand that she needed Jesus as her personal Lord and Savior. What an encouragement to see God’s work in the life of a 15 year old who has so many years ahead to experience life as His child. 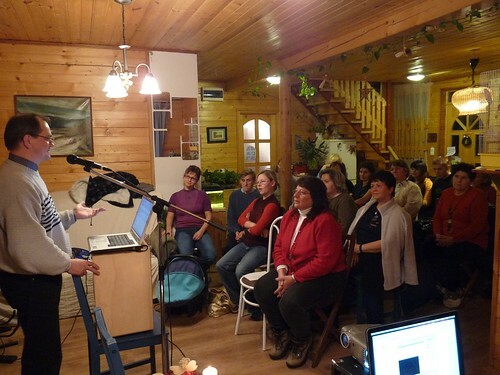 Above: DezsÅ‘ preaching about peace being only found in Jesus and not found in circumstances. 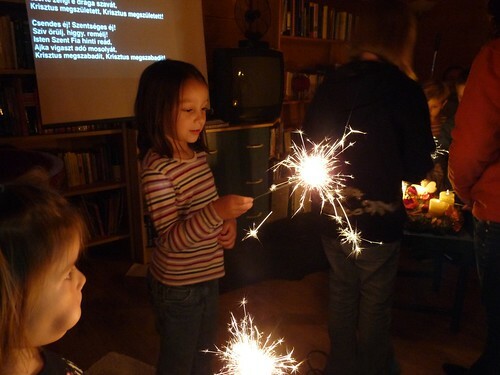 Above: Closing service by singing Silent Night with sparklers (culturally acceptable here) instead of candles. Sharon is standing next to Niki’s mother who attended to witness her baptism. 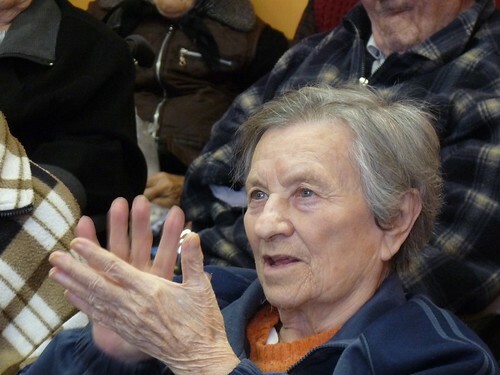 Niki’s grandmother also attended and had an enjoyable time. Please pray that as the Gospel has begun to spread from Gabi, to Niki, that it would also go further through his family for their salvation. 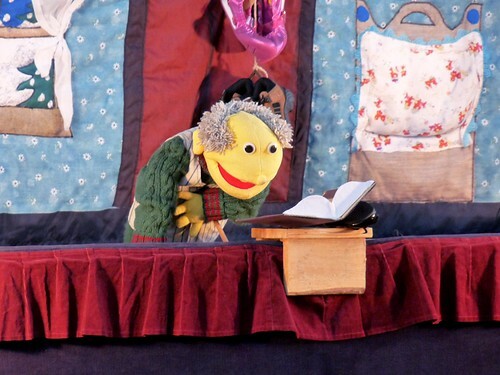 Thank you for your continued prayers for our puppet ministry! Tomorrow we will hold our last show in our hometown of PetÅ‘fibánya. Please pray for God to draw kids to come as this is an optional presentation since kids will have already been finished school for winter break. Please pray also for Elianna who had a mild fever tonight and for Miki’s son Bence who is recovering from an ear infection. Above: The weather continues to be blistery cold with mild accumulation each day. 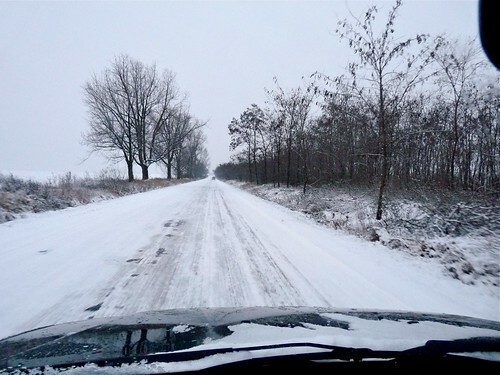 Thankfully, the majority of the main roads and back roads have been plowed or sanded which was very helpful. 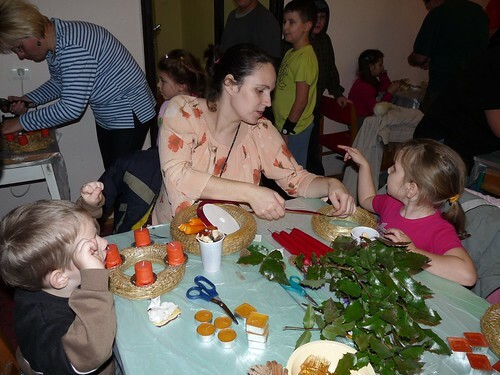 Above: I actually enjoy visiting these smaller preschools in villages like Szarvasgede. I have a bit more one on one interaction with the kids as we set up the stage. These kids were telling me all about their week and how they built snow men and went sledding. Above: One of our ice-breakers with the kids is getting them to build an imaginary snow man with us (and having an imaginary snow ball fight as well). 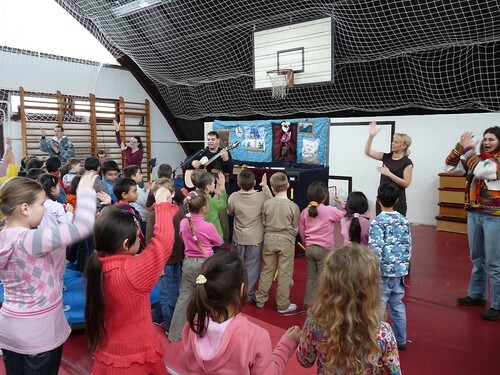 Above: Teammates, Miki, his wife Erika and Hugi showing the kids the motions in ErdÅ‘kürt. Above: As you can see, kids all the way into middle school showed up for the show in ErdÅ‘kürt. We thank God for allowing us to use this show to tell them about the birth of His Son Jesus as Savior. Above: Norbi and PetÅ‘fibánya’s mail lady. 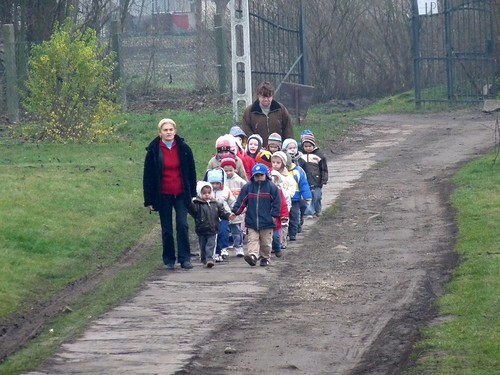 Before going to our third show, we needed to pick up our kids at preschool. You know you live in a village when the mail is delivered to your car while you pick up your kids. Above: Elianna and Kira finishing their last day of preschool before Christmas break. 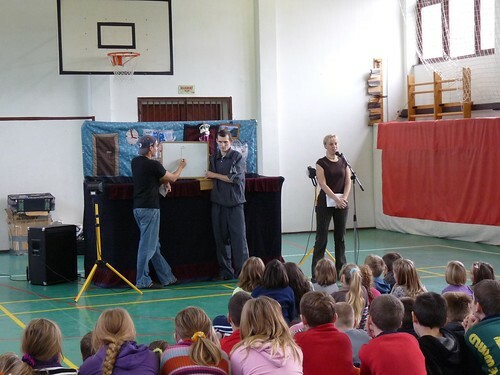 Above: Our third and final show for the day was in the village of kisbágyon. After the show we traveled to Hatvan to pick up Norbi’s mother from the hospital. She was very thankful and told me how surprised she was that no one else in her family was available to pick her up. This just gave the church another opportunity to show Christ’s love for her. Since we have only two shows (Monday and Tuesday) scheduled for next week, we decided to have our team debrief meeting after our last show today. The meeting was very encouraging as we recalled how we saw God at work. We were once again amazed at how smoothly this group of seven people worked together in unity and love through the entire two weeks. I have not seen one angry outburst, frustration or careless word spoken through this stressful time. We praise God for the unity we have in His Spirit and how God led us through these two weeks by His grace. Please continue to pray for us as we have a show on Monday in a neighboring town that has not allowed us to perform in their school. 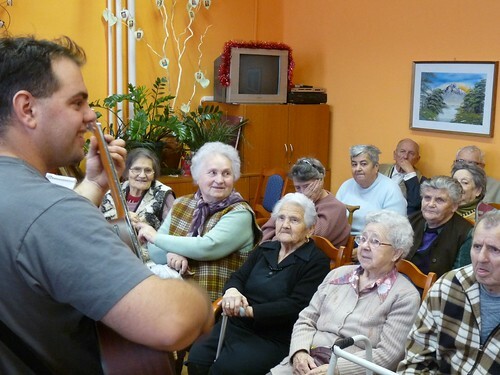 Instead, we will be performing in their retirement home and we hope to bless the elderly in this home and also hope to build relationships allowing us to be invited into the town’s school. 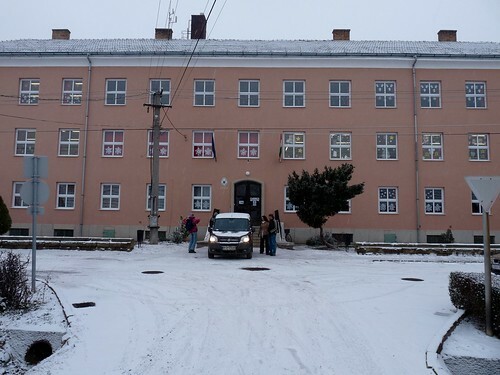 Above: After making our way slowly to the town of Szirák on snow and ice covered roads my car couldn’t make it up the final hill to the school. Oh, so close. Miki came to the rescue with a pair of snow chains for our tires that gave us the traction needed for the final steep incline. Praise God that he had chains that fit my vehicle! Above: With the slippery weather conditions, we arrived a half an hour late. While unpacking, we discovered a broken prop for our show that needed a quick repair. Thankfully, there was just enough glue left in our glue gun to fix it right before the show. We were off to a rough start this morning, but once the show began, everything went smoothly. 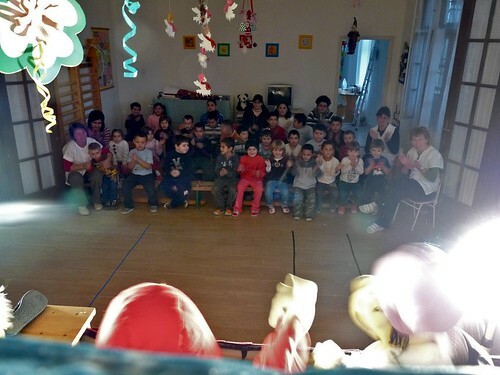 Above: The children in Szirák enjoyed the show and the headmaster invited us back to perform again at Easter. Since we started late, we ended late and therefore were swift in packing up and leaving for our next destination. Above: You can always catch Hugi doing the little things to communicate God’s love to the children in these schools. 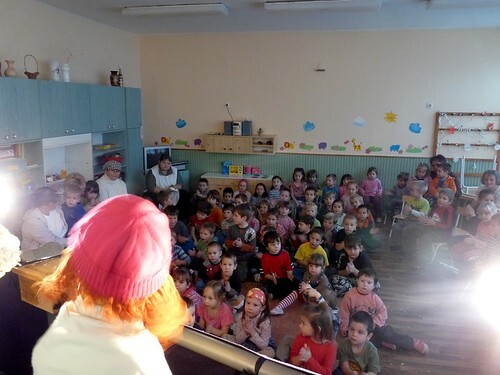 She was quick to come to the aid of the preschool teacher and help the children take their winter coats, hats, scarves and gloves off and help seat the for our show. 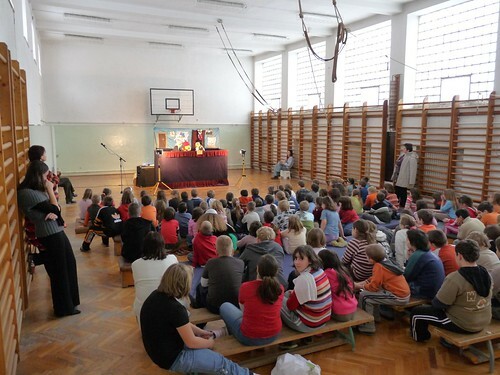 Above: Our third show was in the town of Jobágyi. Thankfully, when Erika and Sharon made the schedule for our shows they sought to group schools together on the same day that are in close vicinity to one another. With our need to travel at half speed on snow covered roads, this was an amazing help in our tight schedule today. 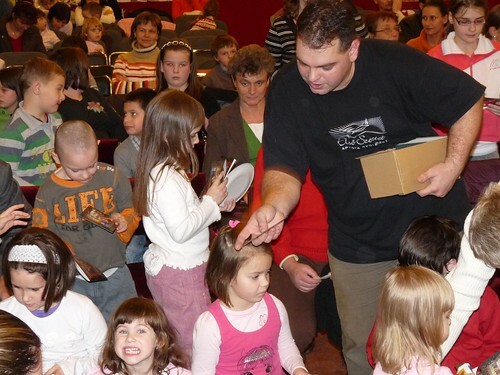 Above: Panov Papa reading the Christmas story from the Bible for the kids. • Protection while traveling in dangerous conditions and success in using snow chains to get to our first destination. • Invites to return to schools at Easter. • Children joyfully singing songs that highlight the true meaning of Christmas. • Visited Norbi’s mother Kati today and she is doing much better. Erika was able to leave a Bible with her (at her request) to pass the time. Kati should be released from the hospital on Monday. • God provided the strength we needed for the three shows. • Please continue to pray for those who are sick (Miki, Norbi and Sharon). • Tomorrow we have three shows lined up. Please pray for strength as we are feeling a bit more fatigue. Pray also for safety while traveling to Szarvasgede, ErdÅ‘kürt and Kisbágyon. • Even though we have two more shows lined up for next week, we will be holding a debrief meeting for our Puppet Team tomorrow at our house. Please pray that members would be encouraged and blessed as we look back upon how God has been at work in one another through this ministry. Thank you for being a part of this outreach through your prayers! 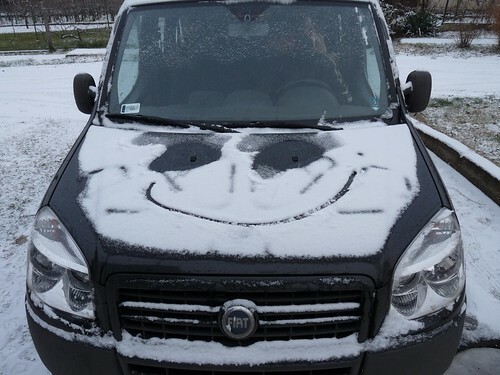 Above: Norbi made my car happy this morning by drawing on the hood. 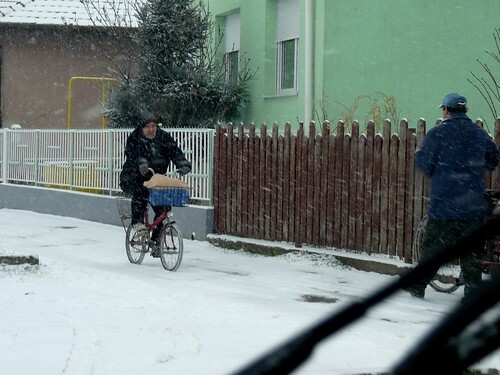 Above: Today we had our first significant snowfall in Hungary. The road conditions were pretty bad, but we praise God for His help in getting us to Selyp safely for our first show. Thankfully both schools we traveled to today are just miles away. Tomorrow will be a different story. Above: These photos capture a bit of the excitement in the children’s faces as they sing along with us and enjoy our Christmas presentation. 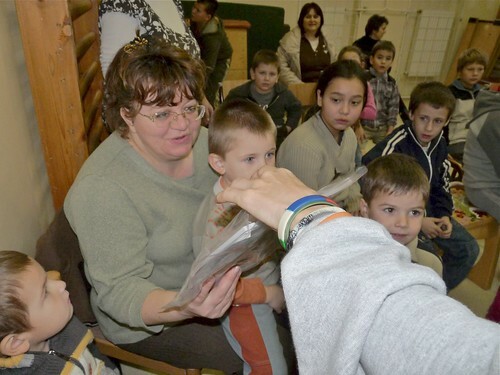 Above: Continuing to distribute evangelistic CD’s and magazines to the children. Above: The snow continued to fall as we traveled over to the neighboring town of LÅ‘rinci. I am amazed at the balance of the many older folks riding their bikes to and from the market in the morning on icy sidewalks. Above: Having a little fun before our next show starts. Above Top Row L to R: Norbi, Peti and Hugi. Bottom Row L to R: Miki, Sharon and Erika. • The road conditions were very dangerous, but God protected us and gave us safety in traveling. 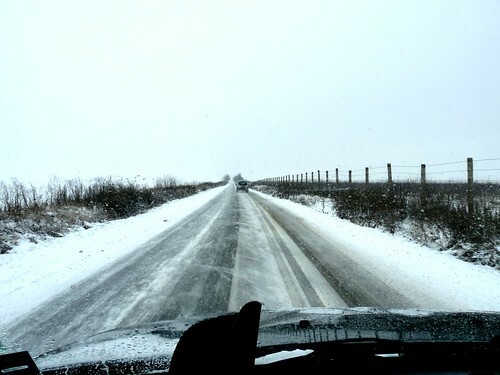 • The temperatures have dropped drastically which can cause havoc on our vehicles... but all worked well. 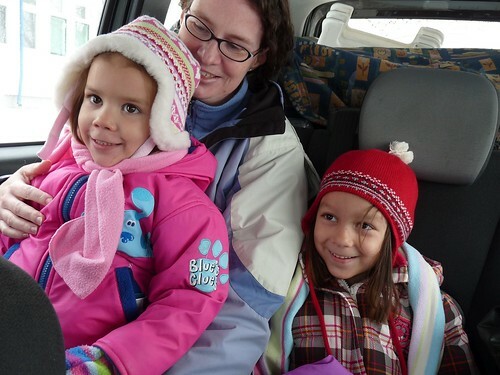 • We were able to work out getting our kids to various places throughout the day, even with the slippery conditions. • Ellie and Kira were able to get their flu shots and they are doing well. • Norbi’s mother said that she is feeling a bit better, but still in pain from the surgery. 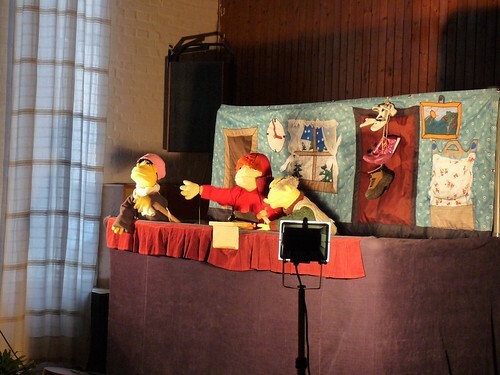 • The Puppet Shows continue to go well without distractions from technical problems or outbursts from disruptive kids. 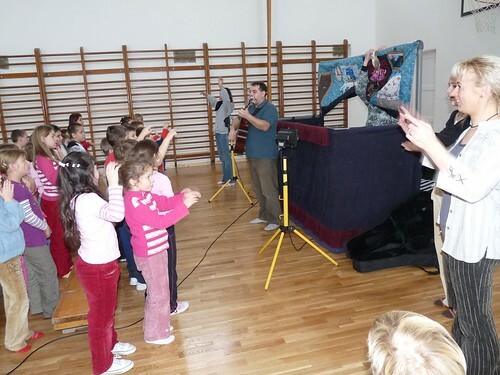 • Children are very excited to join in while singing and interact with the puppets in the show. • Erika’s message after the show is coming across clearly and we praise God for the possibility to read God’s Scripture in public schools. • The forecast shows no signs of low temperatures and snow letting up. Please pray for safety as our team travels with two vehicles. • Tomorrow we have three shows scheduled tightly together, our most challenging day yet! Please pray that we could make it to each school on time for set up and our performance. Also for strength for the puppeteers. • We hope to join Norbi tomorrow to visit his mother Kati in the hospital. Please pray that she would be encouraged by our visit and have another personal experience of God’s love being extended toward her through the church. Above: After a half hour journey through the valleys and hills leading up to the city of Gyöngyös, we safely arrived in the small town of Gyöngyösoroszi. 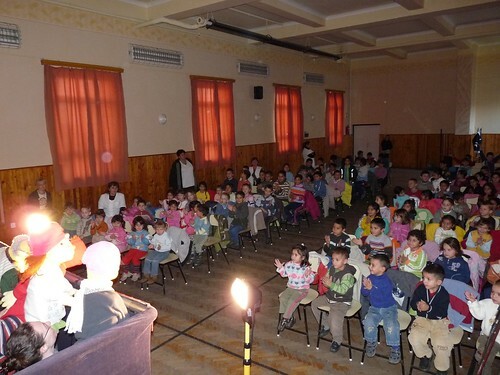 This town was gracious in providing the use of their local community center which allowed the young school kids and preschool kids to all see the show together. 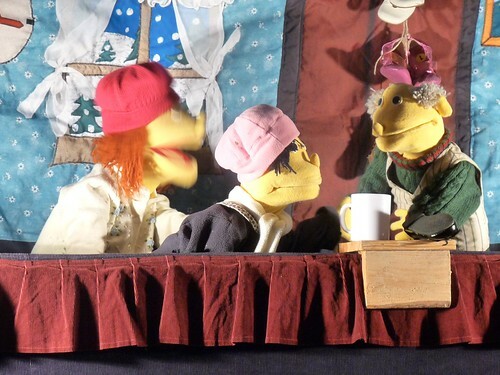 Above: At various times in the puppet show, the main character Panov Papa asks kids questions and it is great to hear them respond with the right answers. 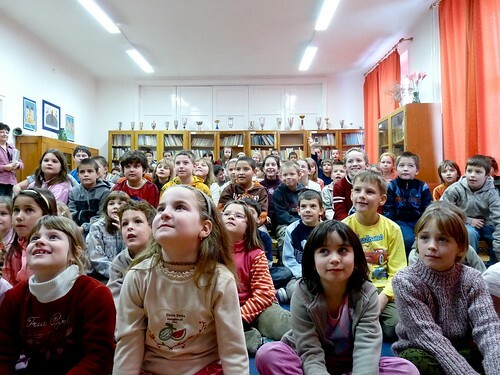 These kids were glued to the show and once again (which is not always normal) there were no distractions. 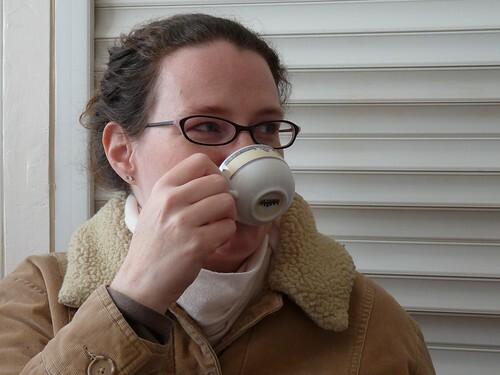 Above: Sharon enjoying the Hungarian coffee offered to us after the show. The teacher pictured above talking with Miki shared the school’s need for a special education teacher. Once Miki’s wife Erika revealed her qualifications, the teacher was close to begging her (with a smile) to come teach there. The neighborhood is comparable to an inner city, low income community. 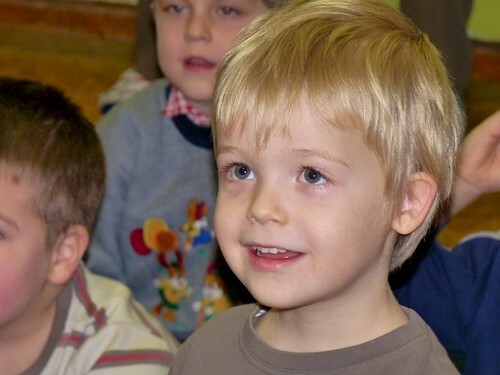 There are many family problems which negatively affect the kids and how they behave in school. In a word, the teacher said, “It’s tough”. 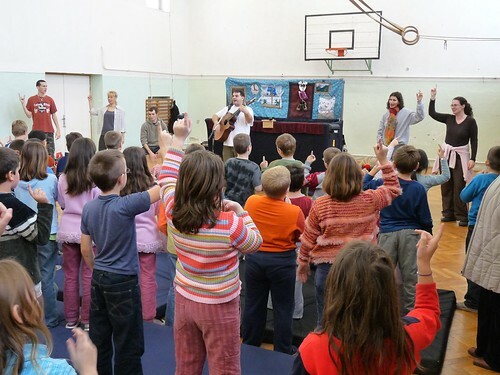 Above: Since our next show in Zagyvaszántó was later in the afternoon, Niki was able to join us after school. Niki has been through our baptism/foundations of our faith class and will be baptized this Sunday. We praise God for His work in her life and how she has matured in her faith over the past two years. Because I had to double back to pick up more people, I had to drop off Niki and Norbi at the community center with all our puppet gear. Niki told me afterwards that a car stopped offering help, thinking that Norbi and Niki were a married couple kicked out of their home with no place to live. Hilarious. Above: Miki continues to press on even though he has struggled with sickness since last week. 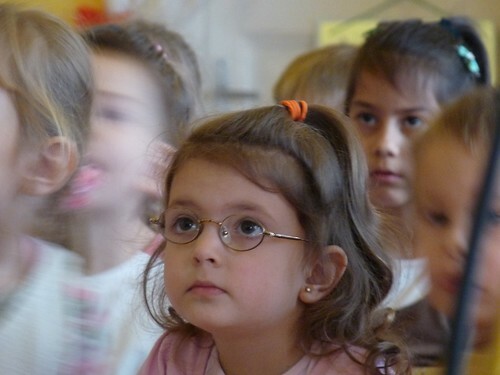 Above: For the past few years, Zagyvaszántó is one of the few towns that has not allowed us in the public school. 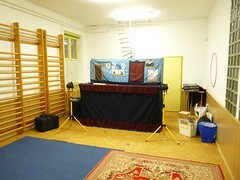 For that reason, we have had to organize the show in their community center and advertise with posters throughout the town. As you can see in the photo, the majority of those that came are our own kids. 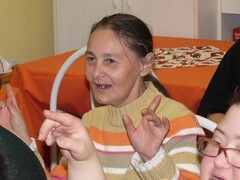 But thankfully, their were around 10 others who came from the town including Klári who attends our English Bible study. It was a joy to see Klári see more about what we believe in a different context and also a joy to see her daughter singing along with us. 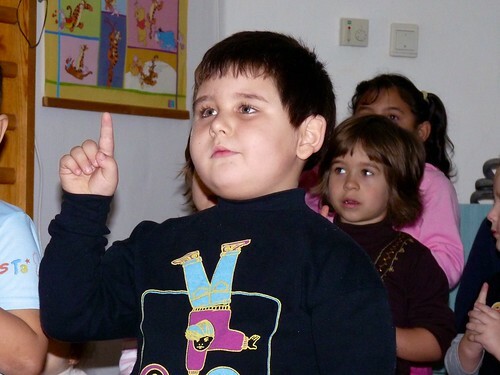 Above: Miki’s son Bence and our son Ben. Both of them are improving as they have been sick for the past week. Above: Illustrations to accompany Erika as she speaks about Jesus coming into the world as the light of life saving sinners from darkness. After each show Miki asks, “So what do we remember when we see a candle lit at Christmas.” The kids yell, “Jesus.” We are thankful that they are hearing these basic yet monumental foundational truths at a young age. • Cold weather, but clear and great for traveling. 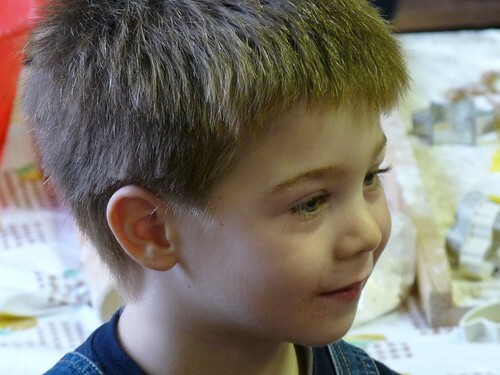 • Kids slept through the night and Ben was feeling (and looking) better today. • Norbi’s mother is out of surgery. She will remain in recovery at the hospital this week. 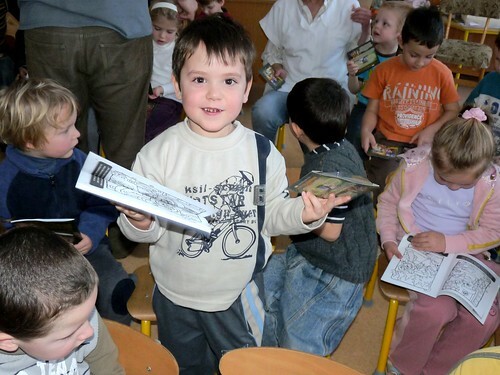 • Kids overjoyed receiving magazines and CDs which contain the puppet show and teach other truths from the Bible. 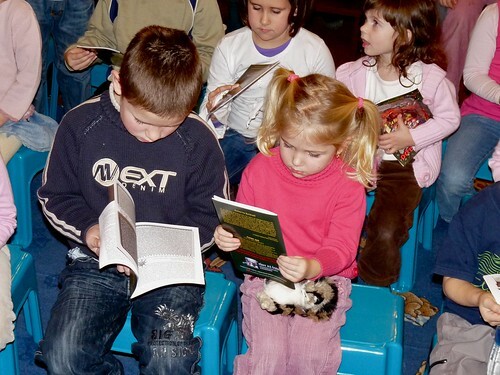 • English Bible study student came with two of her kids to our Zagyvaszántó show. • As we enter the middle of the second week, please pray for stamina and sustained joy as we bring this message to hundreds of kids this week. • We have a tight schedule tomorrow because of having to get various kids to other programs throughout the day. Please pray that we could work out the traveling/picking up/dropping off and getting to various places in the times we need to. • Ellie and Kira are scheduled for a flu-shot in the afternoon. Please pray for them. 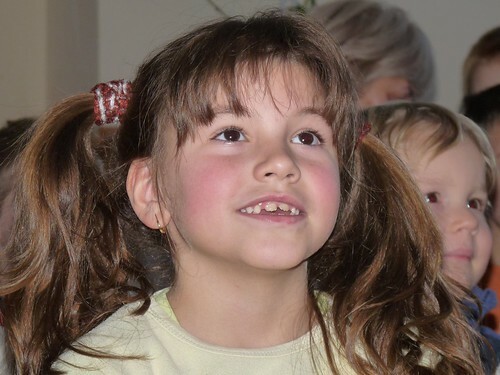 • Please continue to pray for Norbi’s mother Kati to fully recover from surgery and to be drawn to God. Above: Greeted by morning flurries and brisk cold air, we made our way over to our local preschool to present our Christmas puppet show. Anita (seated with girl in green shirt) came to me before the show to express her thanks for helping her son years ago. He was a student in one of our local English classes and has now gone on to work as an engineer. 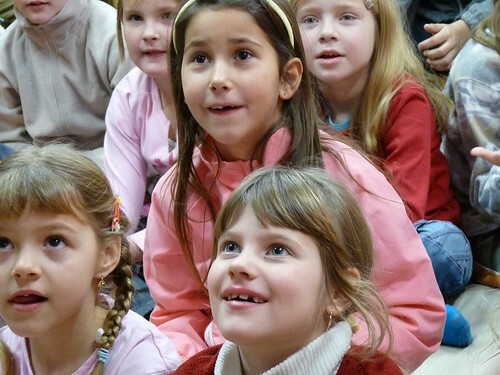 Above: Both our daughters, Elianna (far left) and Kira (red dress) attend the local preschool which opens the door for various connections with the community. Kira just began this year and has already picked up a basic understanding of the language. 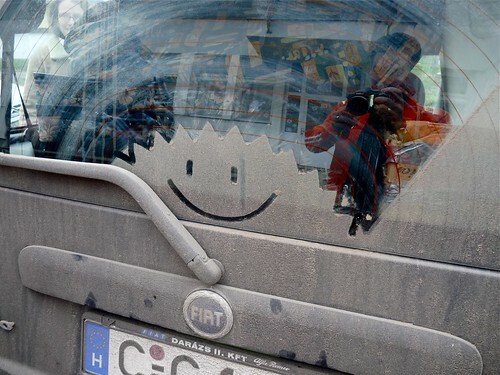 Above: Turning my dirty car into a palette for some sunshine smiles. I’m really thankful for the vehicle God provided years ago. It is a great family car and utility vehicle for this type of ministry. People are always amazed at how much we can fit into the trunk. 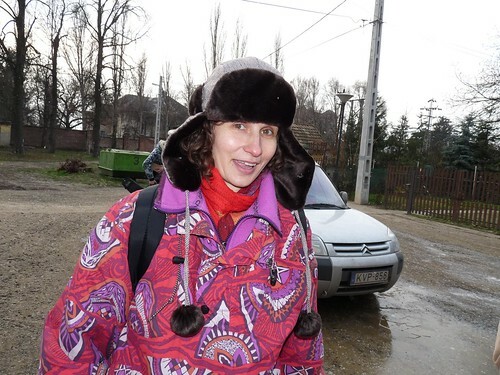 Above: Hugi in her winter gear... it sure got cold over the weekend here after a very mild winter. 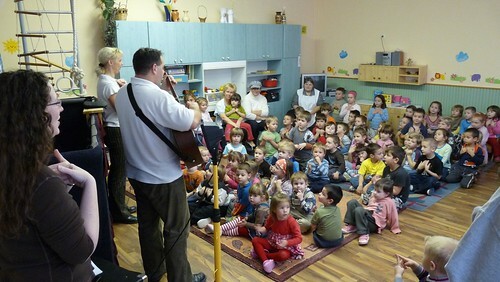 Above: This was the first time we have been able to perform in Selyp’s preschool. Peti (above drumming) has two children who attend this preschool. We had a very kind reception and the kids had a wonderful time learning new songs and watching this year’s show. Above: After the show was completely over and we began packing, the kids seated in the second row above began singing what they just learned without our help. “The greatest gift is that He (Jesus) came for me.” When we told the kids that they were receiving a gift CD and magazine they erupted with joy. One child said, “You mean I can listen to the show at home?” Praise God for these materials that continue telling the truth about Christmas even after we go home after each show. • Even though there was snow, there was no accumulation which helps us as we travel to various schools. • Sharon was able to return to the team and did a great job doing her parts in the show. 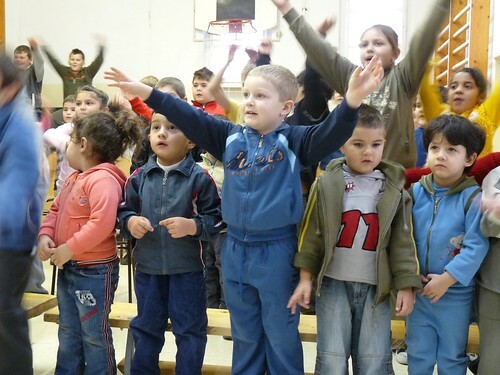 • Our kids were able to return to school after a week of being feverish and coughing. 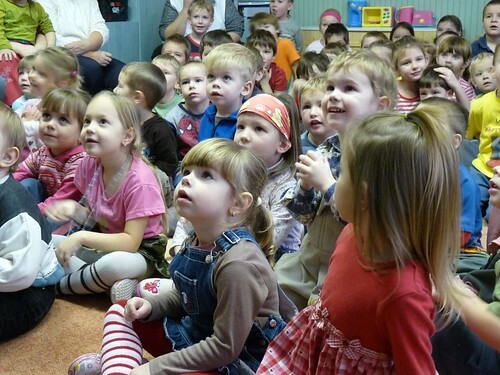 • God opened a door in the Selyp preschool so that we could attend for the first time. This usually leads to return invites once they have experienced the show once. 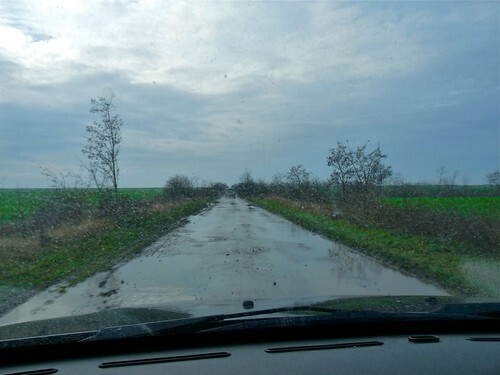 • Cars still working well in cold weather, and God protected us as we traveled. 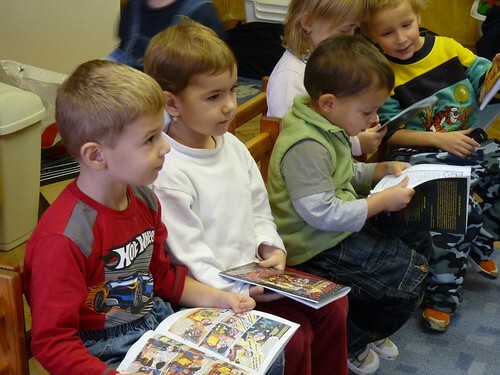 • Kids payed attention in both schools and were able to answer questions accurately afterwards. • All equipment continues to work without problems which protects the message from distractions. • Ben slid back into a low grade fever after returning home from school. He also is complaining of headaches. He had trouble sleeping last night and was up around 3:00. Please continue to pray for healing and for the team member’s children (also Bence who is sick) to be able to sleep to get the rest they need. • Norbi’s mother who joined us on Saturday is currently in the hospital for scheduled surgery on something potentially dangerous. Please pray for Kati (pray also for her and her son’s salvation). • Snow is forecast for the whole week and this will be a more full week than last with travel. Please pray for protection as we travel in these conditions. • Tomorrow we have two shows. One in Gyöngyösoroszi and another in Zagyvaszántó. 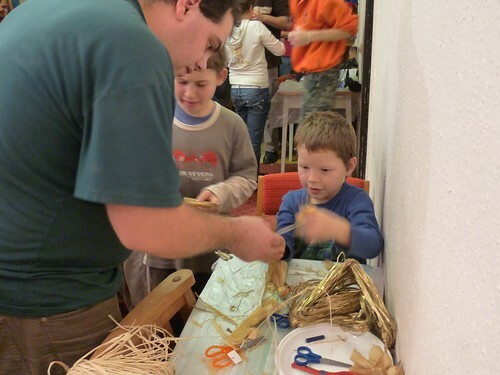 Above: With the flu going around, the cold weather and so many other things families could choose to do on a Saturday, we were encouraged to see such a great turn out in the town of Gyöngyös. The benefit of this show was that parents were also present and were able to hear the same message of truth we are delivering to kids in the public schools throughout our region. 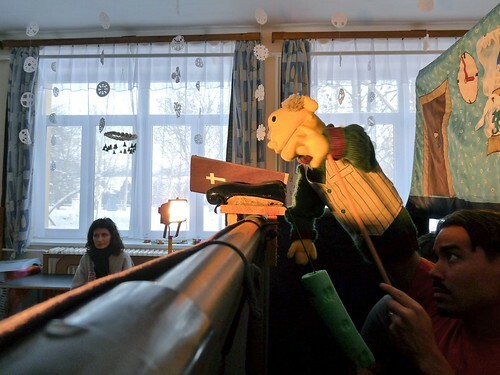 Above: This year’s puppet show is based on Leo Tolstoy’s short Christmas story, “Papa Panov's Special Christmas”. 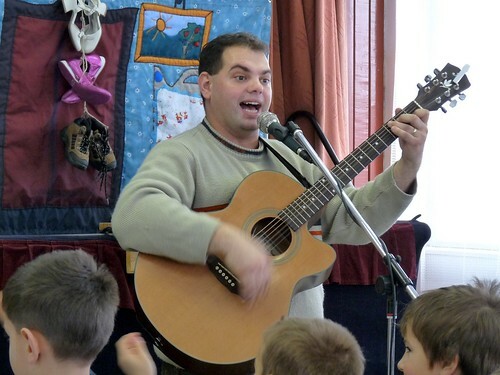 Papa Panov, after reading the Christmas story out loud to the kids, says to himself, "if only they had come here! I would have given them my bed and I could have covered the baby with my patchwork quilt to keep him warm." Jesus then says to Papa Panov in a dream, “Look for me tomorrow. It will be Christmas Day and I will visit you. But look carefully, for I shall not tell you who I am." 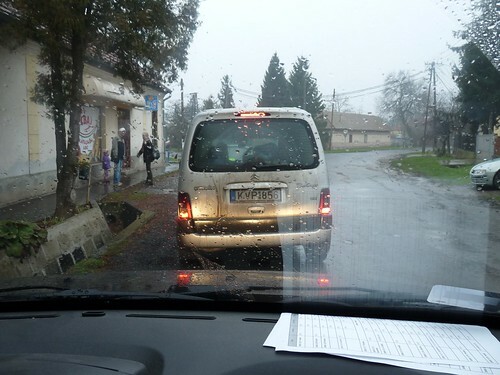 Waiting anxiously, Papa Panov ends up helping a street sweeper, a poor young mother, and others with food and clothing throughout the day. As the night approached and it was time for bed, Papa Panov felt let down, thinking it was just a dream and Jesus had not come. 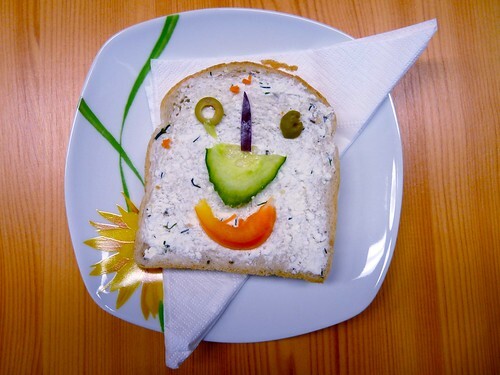 Then Papa Panov sees a vision of the people he had helped through the day and the voice of Jesus saying, “I was hungry and you fed me, I was naked and you clothed me. I was cold and you warmed me. I came to you today in everyone of those you helped and welcomed." One of the people who helped organize the show today told us that there were a few who came to her afterwards in tears. Norbi, who has been helping us for the past week invited his mother Kati to join us today. Both Norbi and Kati have visited our church and outreaches and we were thankful for their company today. After the show, the organizers invited us for refreshments and the conversation led to how God brought us to PetÅ‘fibánya. I was very thankful for Kati being there with us to hear these testimonies. • Our children are doing much better and all slept through the night. Praise God for bringing healing. • This was the first time we performed in Gyöngyös and there was an amazing turn out for a Saturday show. • All equipment working well. The message is being communicated without distractions. • Norbi’s mother Kati was able to spend the day with us. • Sharon hopes to join the team again on Monday as the kids will be returning to school. Please pray for her to pick up where she had to leave off and remember her parts. 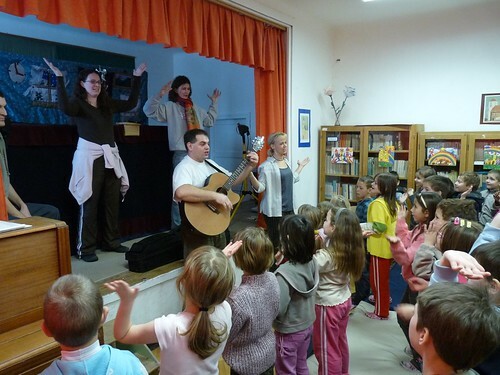 • We will be performing in our hometown preschool and also in the neighboring town of Selyp. 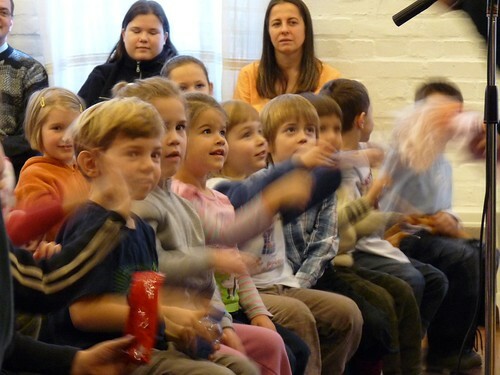 This will be our first time performing in Selyp’s preschool, please pray for good connections with the teachers and for an open door to be able to return again at Easter. Above: This speaker which was graciously donated to us over four years ago has traveled with us every year. It has kept it’s age well, although it’s box isn’t doing so great. Above: The team has become really efficient in setting up without stepping on each other’s toes. 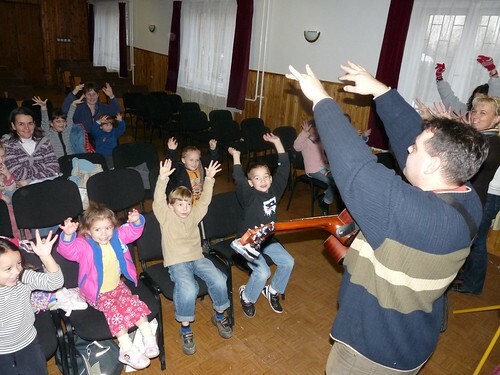 Above: Kids are pretty quick, picking up the lyrics and motions of our two songs about Jesus. Above: We continue to be thankful for the attentiveness of the children in each school. 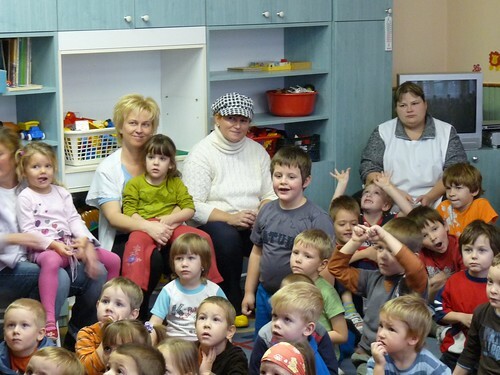 The headmaster of this preschool commented on how the kids followed the story and payed close attention. After the show she treated us to coffee and a common type of Hungarian sweet bread. 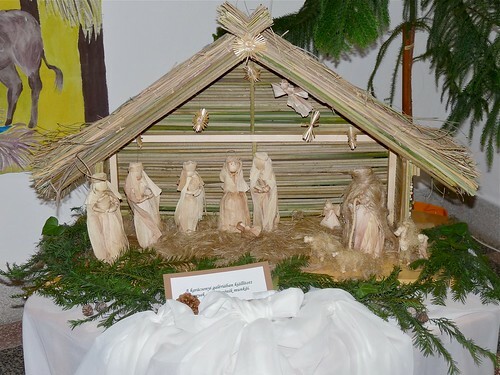 Above: A beautiful nativity scene made from corn husks by the teachers in the Hatvan preschool. 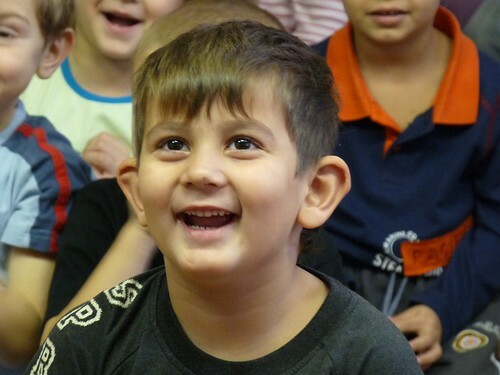 Above: We always get the most laughter from our friends at the Hatvan Special Needs Care Center. 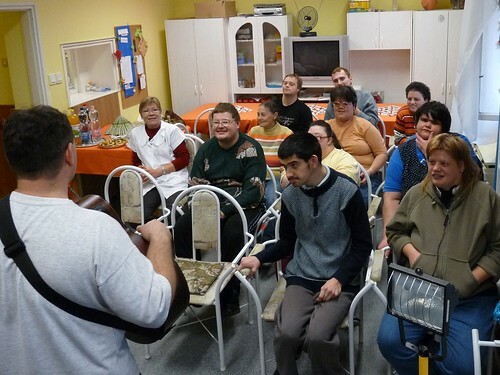 These adults with special needs were full of giggles today and enjoyed Miki’s playful banter before the show. For the past few years, I have seen many in the room go from being completely fine to crying and even screaming. This year was completely different. Each one maintained a joyful countenance the entire time. We praise God for their ability to follow the show and even answer questions at the end. 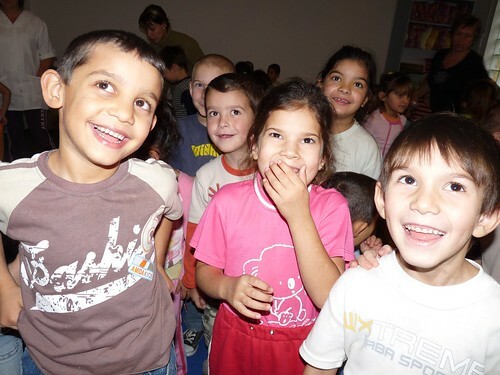 Thank you all for your prayers that are reaching specific needs in Hungary! • Kira was able to sleep through the whole night last night with no croup cough. She is still congested and coughing but we’ll take that over croup any day. • With all the packing/unpacking and handling heavy equipment, no injuries or barriers to team members carrying out the show. • Good connections with the headmasters from both schools today. We were once again invited to come back at Easter. • Ben and Elianna getting better and resting well each night. • Weather continues be good for traveling conditions. • Please continue to pray for Kira, for complete healing. Pray also for teammate Norbi and Miki who are sick. • Pray for a refreshing day of rest tomorrow (no shows). • Pray for our next show which will be in the city of Gyöngyös, the home of a church plant we often partner with. 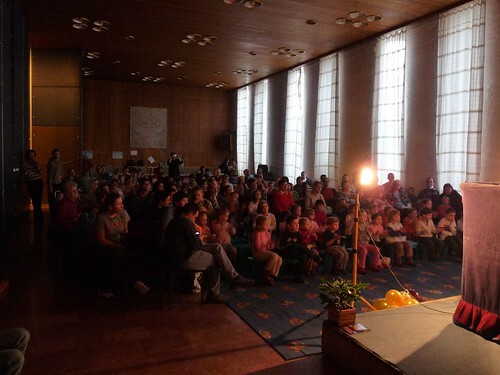 Above: Miki does an excellent job engaging the kids before the show. This year our he leads the kids to build an imaginary snow man, and the youngest to the oldest participate with excitement. Above: Erika sharing the Gospel after the show. 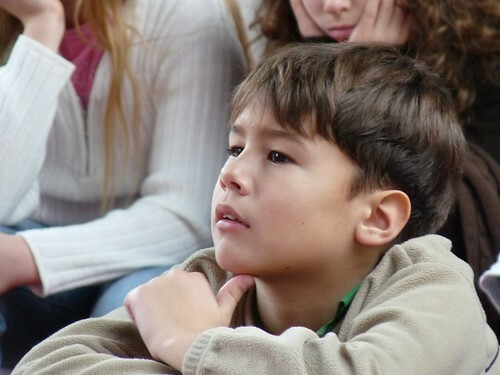 Sometimes it is harder to keep the kids attention when there is a larger audience, but we praise God that they payed attention and afterwards were able to answer Miki’s questions about what we can remember about the true meaning of Christmas. Allen accompanies this time by illustrating different parts of her message which helps keep the kids engaged. Above: We are blessed to have milder weather this winter which makes traveling much easier. 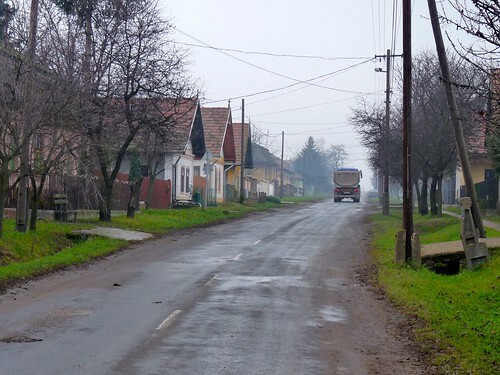 Above: From one of the larger schools, to one of the smallest, our next stop was the village of Nagykökényes. When we arrived, it turned out that they had planned for our show tomorrow and not today (either we or they mixed up the date.) Because of our tight schedule, today was the only day we could do the show and we asked if they could still work it out. They were gracious to be flexible and cleared out their planned cookie making activity for us to do the show. Above: Norbi, Miki and Peti setting up the stage in a flash. These guys have been such a great help in set up and tear down in each show. Above: this is the magazine that comes in the evangelistic gift packets we hand out to the kids after each show. They love them! 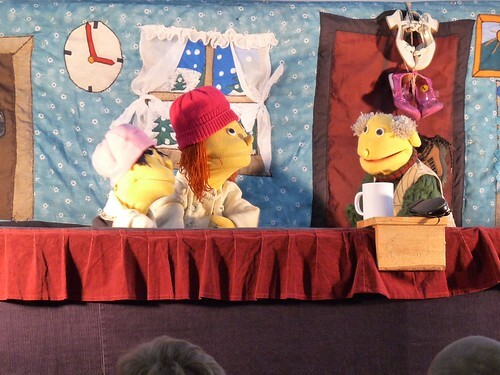 • Kids are getting the point of puppet show and Erika’s teaching at the end of the show. Praise God for them being able to pay attention and understand the message. • I’ll say it again, this team is great serving together. Praise God for unity in Christ. • As our custom, we forgot something important (Miki’s guitar) upon our arrival in Heréd (we do it every year at this school for some reason.) Because we were so early getting there, Miki was able to travel home and back in time for the beginning of the show. 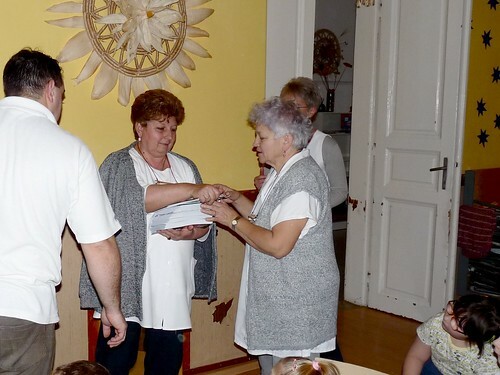 • After the show in Heréd, the headmaster being aware that some from her school attended our VBS in the summertime encouraged us to get the word out to her students for next year’s VBS. Praise God for this open door. • Safety in traveling, technical equipment working well, evangelistic packets being distributed. • Kira’s cough turned to croup cough last night and she awoke having trouble breathing with a 103 high fever. Praise God that a steam treatment/cold air treatment helped calm her and help her to breath to go back to sleep. She has had a low grade fever throughout the day today and in good spirits. 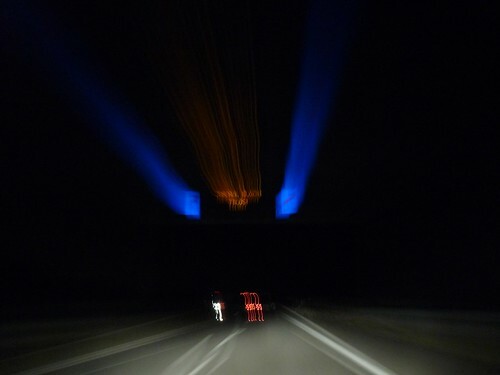 Night time is usually the worst for this type of sickness. Please pray that she would be able to get the rest her little body needs and for healing from this terrible cough. Ben and Elianna continue to have low grade fevers. • Miki and Norbi continue to deal with flu like symptoms. Please pray for them. 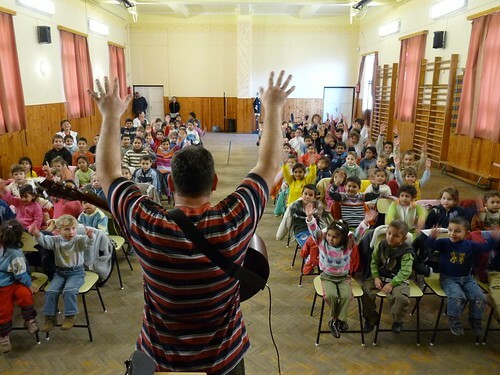 • Tomorrow we travel to two schools in the town of Hatvan. Above: Thankfully the weather has remained just warm enough for rain instead of snow. We made a pitstop on the way to ErdÅ‘tarcsa for Miki to pick up some strong cough drops. 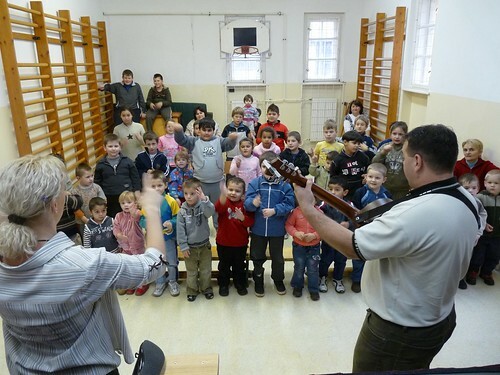 Above: In most schools, the teachers remain seated and almost emotionless, but in ErdÅ‘tarcsa the teachers give their all and join in singing. 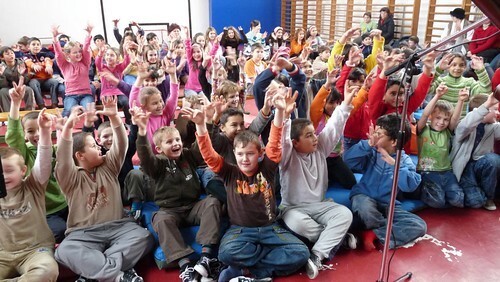 ErdÅ‘tarcsa is one of the schools that has invited us back consistently over the past five years. Above: The teacher above has such a soft heart that she shed tears after seeing our show that highlights showing the love of Jesus to those in need. 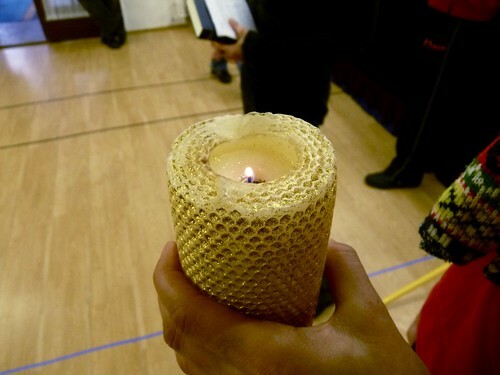 Above: Helping the kids remember Jesus, the light of the world, this Christmas. • God gave us a good nights rest to minister with refreshed bodies this morning. 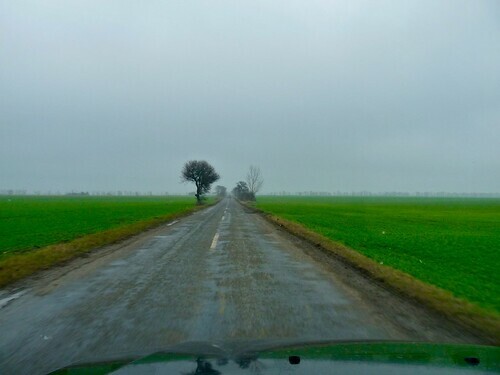 • It’s raining instead of sleet and snow (better for driving conditions). 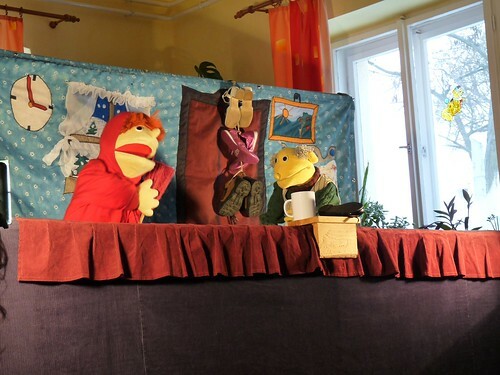 • Kids in ErdÅ‘tarcsa were immersed in the story during the puppet show. • Our team continues to work well together, each person faithfully doing their part with grace and love. • Ben and Elianna have been fever free most of the day today. • Kira has a terrible cough and is feverish and Miki is also dealing with a sore throat and flu like symptoms. Please pray for healing for both of them. • Tomorrow we travel to Heréd and Nagykökényes. Above: Kids from the Egyházasdengeleg pre-school make their way to the middle school building for this mornings Christmas Puppet Show. 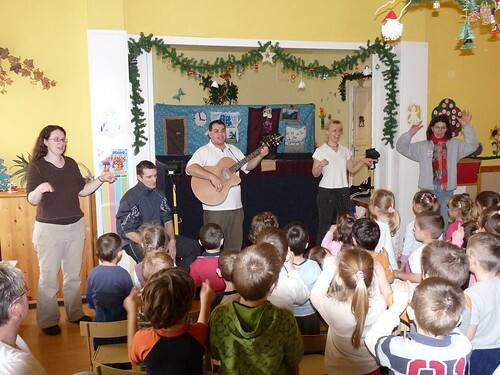 Above: Miki and Erika leading the kids in two of our special songs, “Christmas is here again” and “The greatest gift”. Both songs make specific reference to Jesus coming into the world as the Savior. 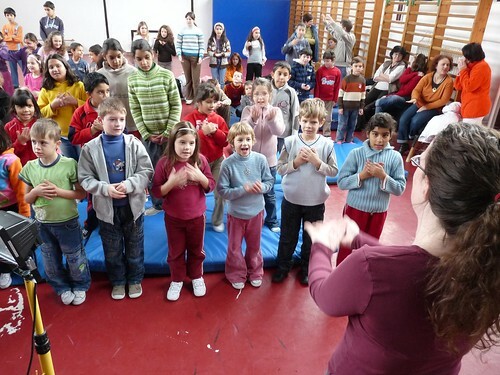 Above: After a few times singing and showing the motions, the kids join in. 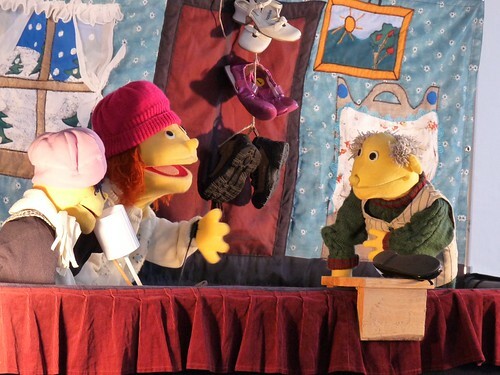 Above: Allen handles the the above ‘shoe-shop owner’ puppet. In this scene he reads the Christmas story from the Bible to the kids. Above: Before the show, the teachers told us about how ‘out of control’ this year’s group of kids were in middle school. 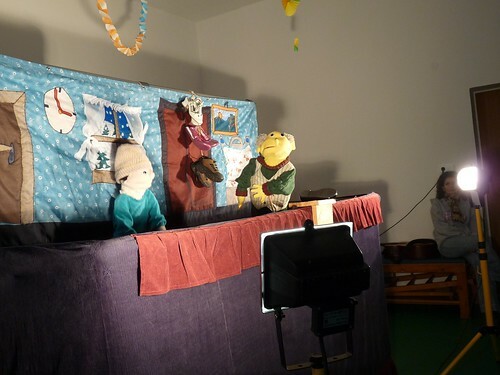 We were thankful that in the puppet show they were able to pay attention and able to follow the point of the story. Above: Erika speaking after the show about Jesus being the way, the truth and the life. Above: Distributing the evangelistic packets after the show. We praise God for using many of you to raise the money to purchase these packets. Above: A glimpse of what the neighborhood looks like. 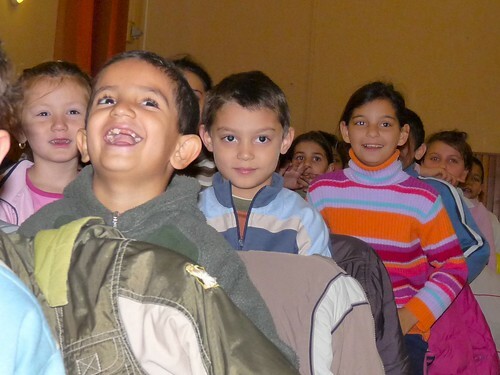 Above: The smiling faces of the children from Kálló, our second destination of the day. Above: Making the motions to the song, “The greatest gift”. 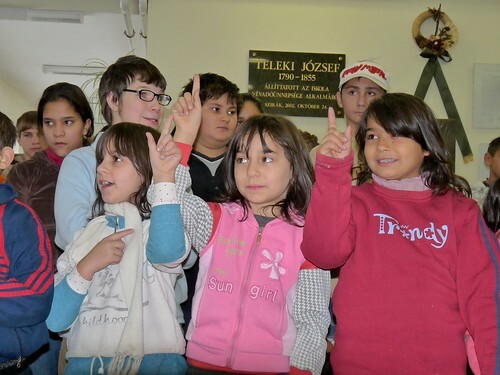 We are always encouraged when we hear the answer to the question, “Do you remember us?” The kids all shout, “IGEN!” (YES!). 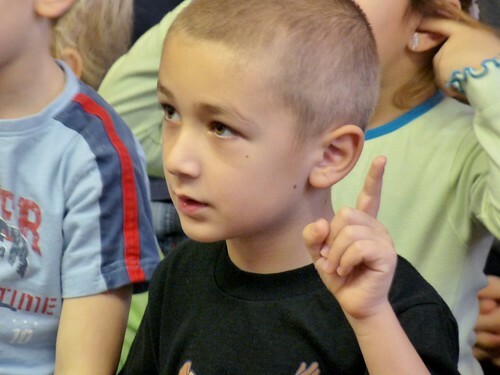 As we visit multiple schools every Easter and Christmas, we pray that the explanation of the Gospel will have an impact on their lives, hoping that they personally put their faith in Jesus. Above: After the show we were invited to the teachers lounge for some creative snacks. Above: Heading home after a great first day of ministry. Thank you for your prayers! • Unity on team, each person serving one another, encouraging one another and helping one another. • No car trouble, and God gave us safety while traveling. • Great first day! Kind receptions at both schools and children payed close attention throughout the show, participating in singing and giving answers to questions. 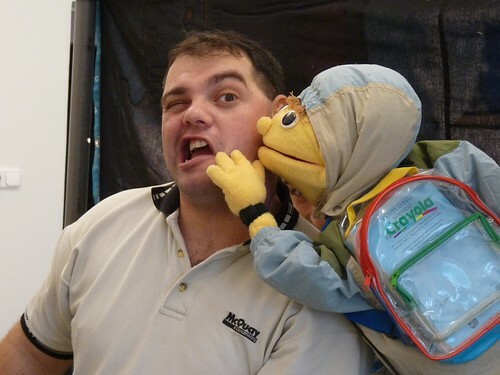 • Successful last minute transfer of a puppet part that Sharon was going to play to Erika. • All technical equipment worked without a problem and there were no distractions throughout the show. • God provided the full amount of money needed for the evangelistic packets. • Benjamin became sick on Saturday night, having a 103 temperature. The girls followed on Sunday with low grade fevers and coughing. With all three kids sick, Sharon is caring for them and has given her part to Erika. Please pray for the healing of our children and also for Miki who is not feeling well. • Miki will be picking up the rest of the evangelistic packets tomorrow and has a lot of traveling to do. Please pray for safety and an opportunity to encourage and bless Norbi and Peti who will be joining him in the car ride. 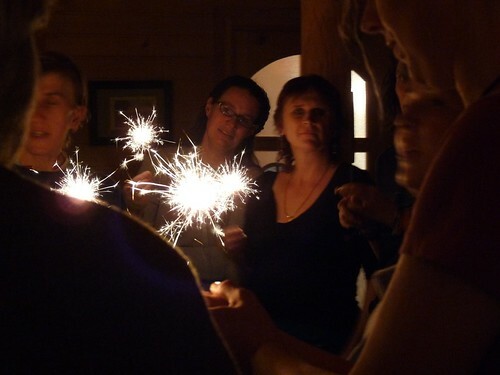 • Tomorrow we head to the town of ErdÅ‘tarcsa, please pray for the team and for the children of that town. Above: We had a great turn out for our advent wreath outreach on Saturday. 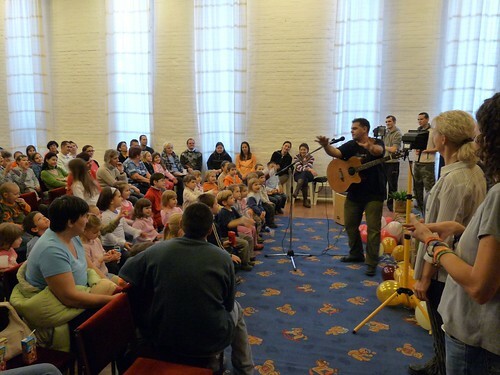 It was great to see the mixture of children, teens, parents and grandparents all taking part! We also rejoiced in having many church members helping in set up and clean up afterwards. 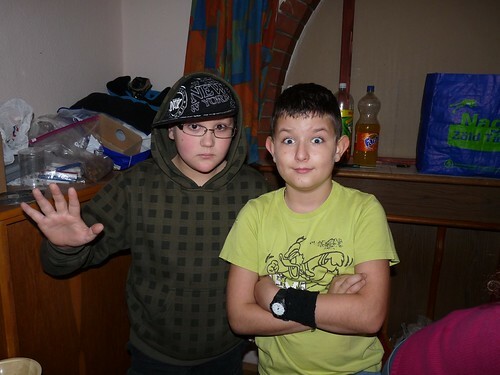 Above: Ádám and Krisztián attend our Friday night teen outreach and most other outreach events we host. We are thankful for this continued connection with them and hope that they one day put their faith in Jesus Christ. Above: Val (a leader of another PI team based in Budapest) gives a brief explanation of what we remember with the advent wreath. Val, along with her team, all pitched in to help set up and blessed us with most of the materials needed for the night. Above: This is the first time that Hajni attended one of our outreach events with two of her children. 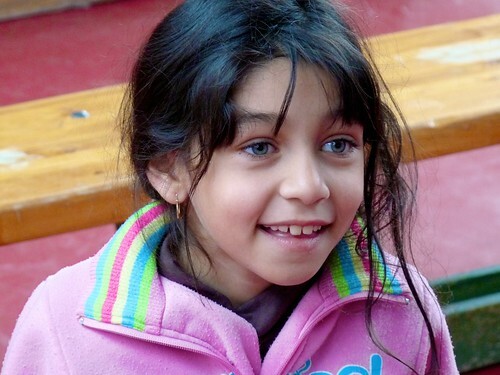 We know Hajni through meeting at preschool to pick up our children. Hajni also sends her kids to Miki’s Bible class every week. She said that she would be glad to come back to these type of events our church holds in the future. 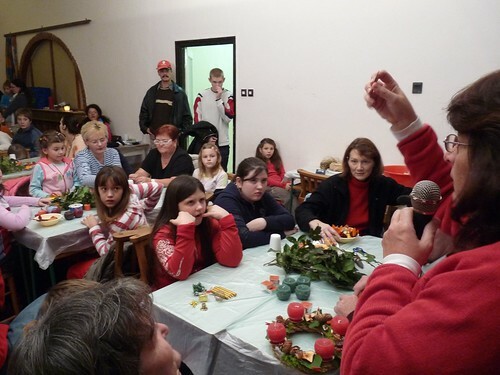 We are thankful that she was able to hear more about Jesus at this event as DezsÅ‘ shared the symbolism of each candle at the end of the night. Above: Kira joyfully showing her finished wreath. 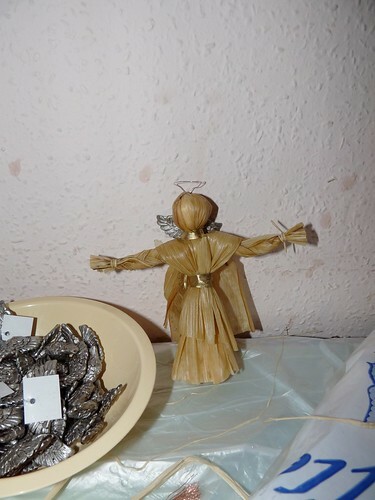 Above: Miki’s angel craft made from corn husks. 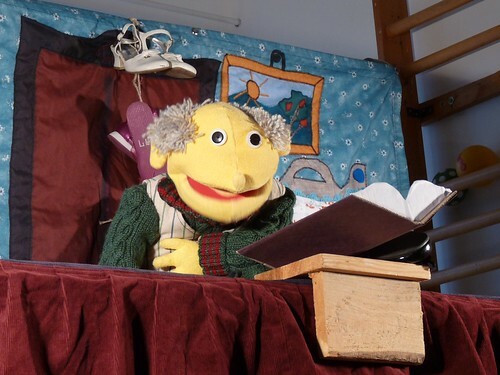 We are now just one week away from the start of our Christmas Puppet Ministry where we will tell the true story of Christmas to over 1000 children. As mentioned in our previous blog post, we are seeking people to pray for us daily from from December 7-22nd. If you would like to join this daily prayer team, please let us know via email. We are close to our desired goal of 10 people on that prayer team. As is ’normal’ in our preparation for this ministry, we are feeling the spiritual attacks of the enemy. In past years, it is in this time frame of preparation to share the Gospel that we were sometimes stricken with sickness, sometimes our children had trouble sleeping or became fearful at night, and sometimes there was miscommunication or friction that happened in relationships with one another. Therefore, we ask you even now to pray for us and our family (as well as Miki and his family) as we practice this week.